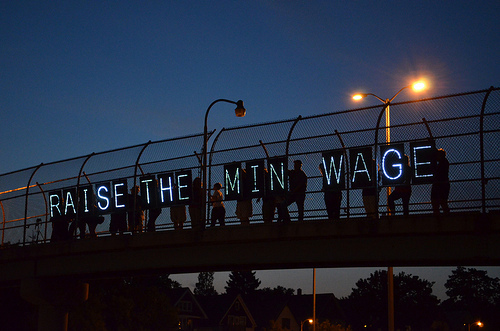 This week, prominent economists, including 7 Nobel Prize winners and 8 former presidents of the American Economic Association, signed a letter to the president and Congress endorsing the economic benefits of raising the minimum wage to $10.10. The letter urges lawmakers to immediately enact a three-step raise of 95 cents a year for three years—which would mean a minimum wage of $10.10 by 2016—and then index it to protect against inflation. This increase would mean that minimum-wage workers who work full time, full year would see a raise from their current salary of roughly $15,000 to roughly $21,000. The proposals would also raise the tipped minimum wage to 70 percent of the regular minimum. “Let’s be clear: our federal minimum wage of just $7.25, which has not budged in more than four years, is now a poverty wage. No American who works a full-time job should have to struggle to put food on the table or pay the bills,” said Senator Tom Harkin (D-Iowa), who is Chairman of the Senate Health, Education, Labor, and Pensions Committee. “All around the country, we’re seeing the impact of growing income inequality and stagnant wages on millions of American families. Raising the minimum wage will help narrow the income gap and enable millions of low-wage working Americans to make ends meet. “As the letter released by the Economic Policy Institute shows, economists and experts agree that raising the minimum wage isn’t just the morally right thing to do, it’s also the smart thing to do for our economy, sending $22 billion into the economy and adding 85,000 jobs over three years thanks to higher consumer demand. Now is the time for action,” Harkin added. The signatories of the letter include seven Nobel Laureates: Kenneth Arrow, Peter Diamond, Eric Maskin, Robert Solow, Thomas Schelling, A. Michael Spence, Joseph Stiglitz. Alan Blinder, former Vice Chair of the Federal Reserve System’s Board of Governors and former member of the Council of Economic Advisors; John Bates Clark Medal recipient and MacArthur Fellow Emmanuel Saez; and Laura Tyson, former Chair of the Council of Economic Advisors and former Director of the National Economic Council, also signed the letter. Additionally, eight former presidents of the American Economic Association, including William Baumol, Angus Deaton, Avinash Dixit, Claudia Goldin, in addition to those who are also Nobel laureates, joined this list of influential economists. The number of prominent economists endorsing this raise in the federal minimum wage is expected to grow, as more signatures are gathered. Lawrence Mishel of the Economic Policy Institute (EPI) and Lawrence Katz of Harvard University initiated the letter and EPI and Center for Economic Policy Research (CEPR) circulated the statement to lists of economists. You can watch video of a briefing at the Economic Policy Institute where Jason Furman (Chairman of the White House Council of Economic Advisers), Sen. Tom Harkin, Rep. George Miller and Lawrence Mishel of the EPI discussed the economic case for raising the federal minimum wage and the path forward to enact the Fair Minimum Wage Act of 2013.